Ricky Gervais is a bit like Marmite (a British sticky, dark brown yeast-based food paste spread with a distinctive and powerful flavour), in that you either love him or you hate the comedian. 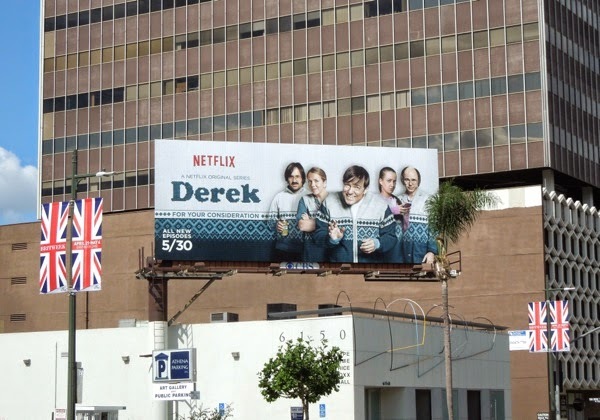 The English funny man, star of the original version of The Office, Extras and controversially hosting The Golden Globes, looks almost unrecognizable in these billboards for his new comedy show, Derek. 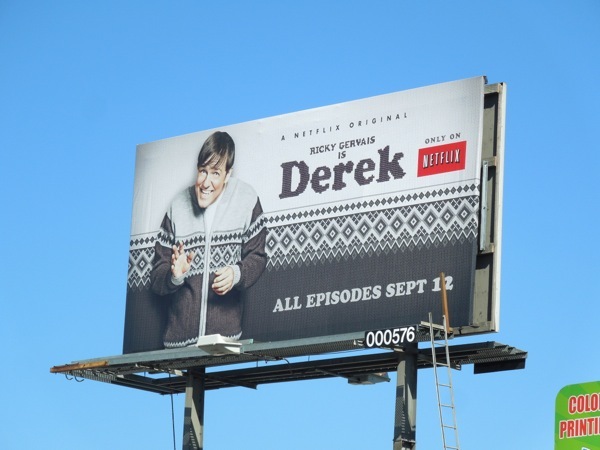 Having already aired in the U.K. on Channel 4, the entire first season of Derek will soon be available to stream on Netflix from September 12, 2013. 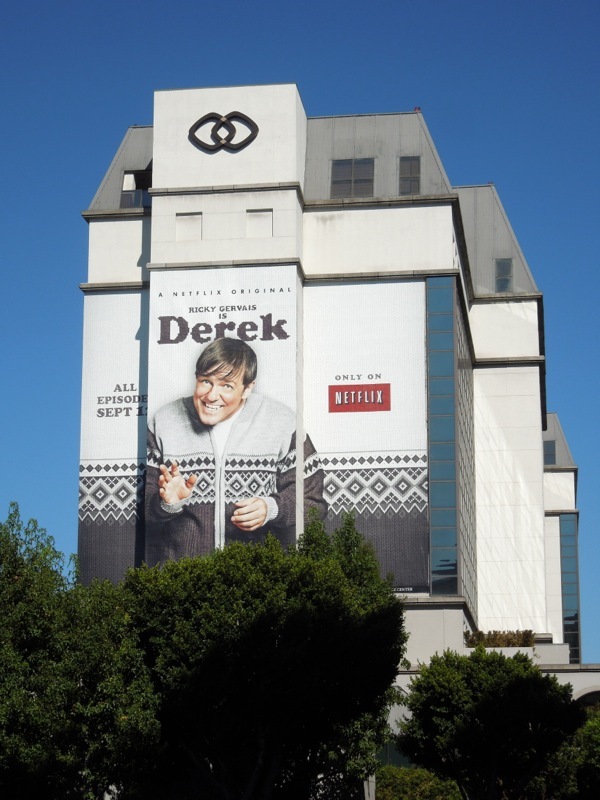 The socially awkward, unattractive and slightly childlike character is a care worker at a nursing home for the elderly home, which is filmed in Gervais' favoured mockumentary style. 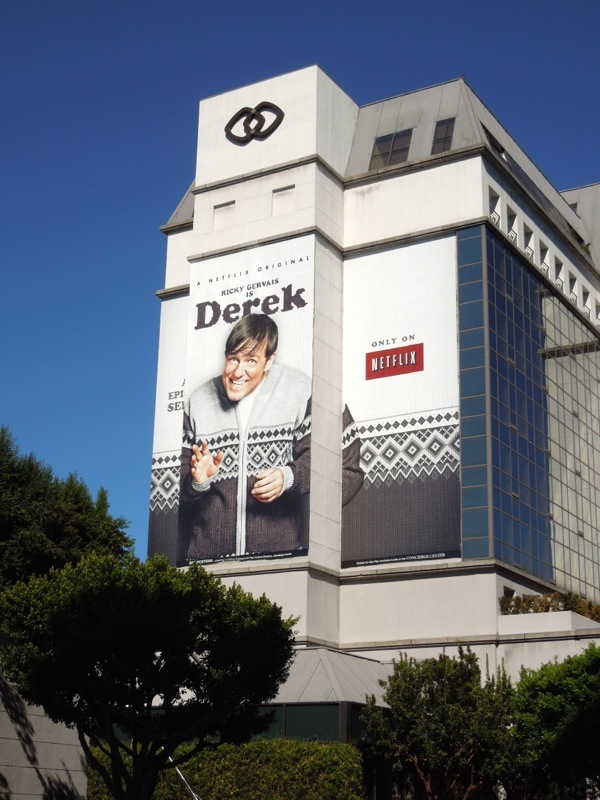 Even if you don't like the writer, director and comedian, you have to admit the visual gag used in this ad creative is pretty funny, with 'Derek's' hideous cardigan blending into the wallpaper design behind him. 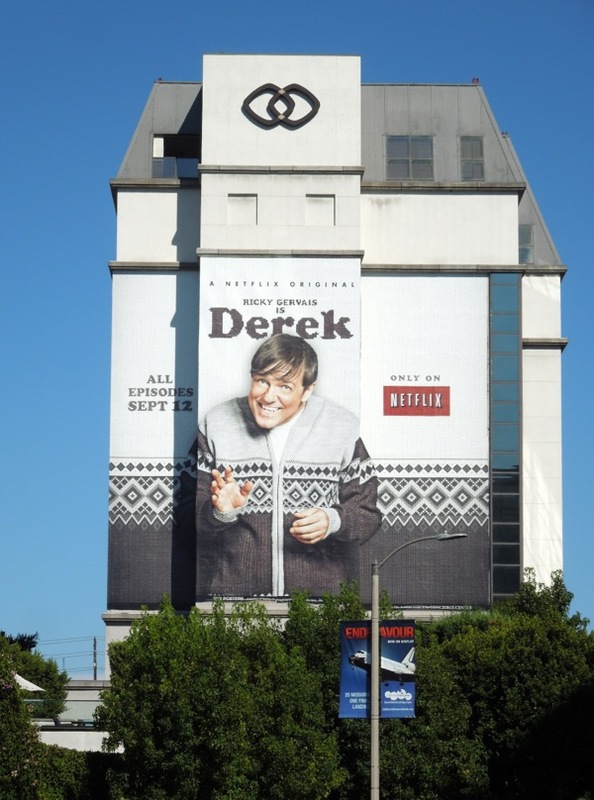 This massive wallscape ad creative for the new comedy drama was spotted on the side of L.A.'s Sofitel Hotel along Beverly Boulevard, whilst the smaller billboard was spied along Highland Avenue, both on September 3, 2013. 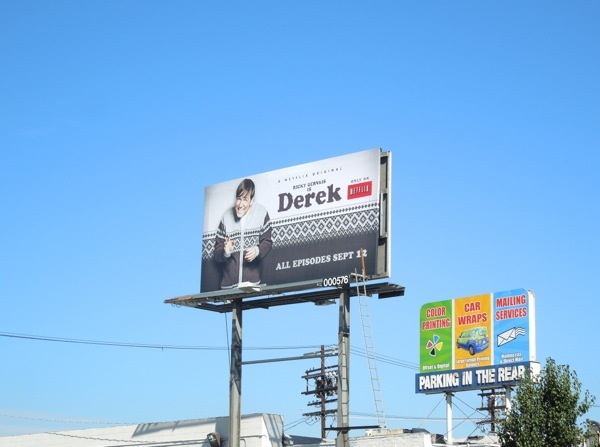 If you are a fan of the comedian, be sure to also check him out in these billboards for Life's Too Short and The Ricky Gervais Show. 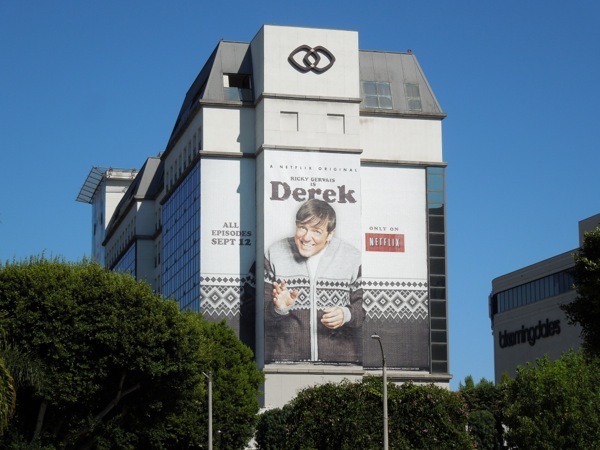 That's it for another TV WEEK here at Daily Billboard, but come back soon as the new series and returning shows are coming thick and fast to the skies of L.A. 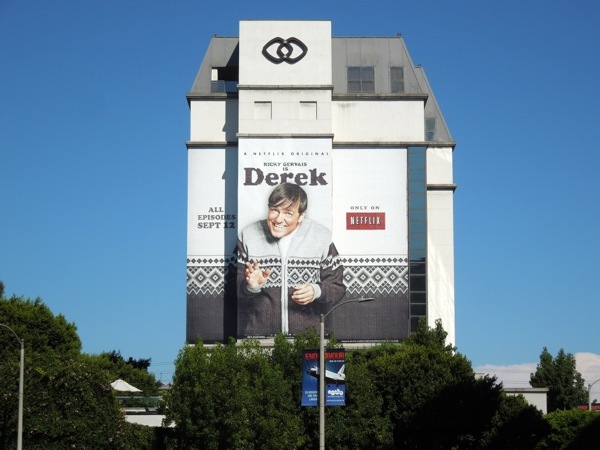 UPDATED: Here's the sophomore season billboard for Derek on Netflix, which takes the season one creative and adapts it to showcase the wider cast in their matching cardigans. 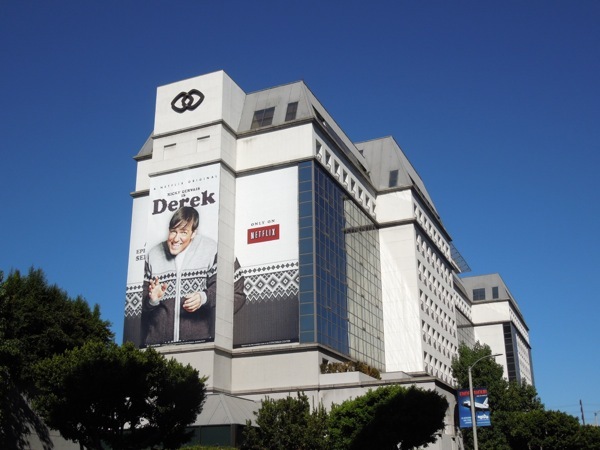 This season two billboard was snapped along Wilshire Boulevard on May 6, 2014 and also doubles as an Emmy Award consideration creative.